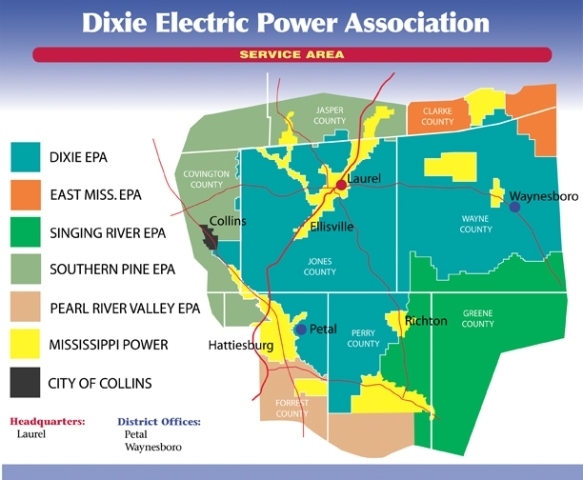 Dixie Electric Power Association’s Annual Meeting is held on a Saturday during the month of October each year. Two or three board directors, who serve three year terms, are elected at the Annual Membership Meeting. Starting in June/July of each year, information about the annual meeting will be in the Today in Mississippi newspaper and local media. If you can’t make it to the annual meeting, you can send in your proxy or absentee ballot. These are mailed to your residence along with your official meeting notice approximately three weeks before the Annual Meeting. You can also vote online if you have an email on file with Dixie Electric. Vote! It is a benefit of membership in your electric cooperative. The 2019 Annual Meeting of the Membership is scheduled for Saturday, Oct. 19, 2019, in the association’s auditorium at the Laurel office. Registration begins at 10 a.m., and the business meeting follows at 11 a.m.